No charge for "Walks of Dane County"
We'll park at the trailhead for Edna Taylor Conservatory and meet our guide. 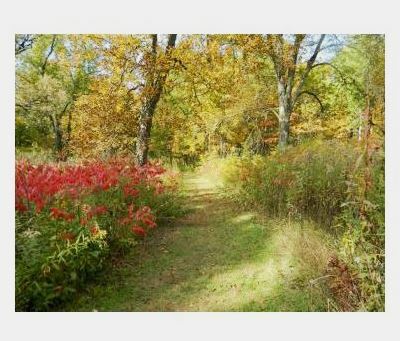 We'll walk through the Edna Taylor Conservancy, through the ajoining Aldo Leopold Nature trails and City of Madison woods. We'll stop off at the Aldo Leopold Nature Center to learn about the Center's innovative teaching facilities. We'll visit the ALND with access to their interactive theaters, digital touchscreen curriculum, renewable energy displays, and hands-on Leopold Family Phenology Center. along with their lobby Nature Nooks and outdoor interpretive trails. They continue to integrate age-appropriate climate change education across all programming to help children and adults understand these impacts, how their actions affect the environment, and how they can enact solutions to ecological challenges. A glacial drumlin rising above a broad ribbon of marsh forms the backbone of this southeast Madison Park. On-going projects are oak savanna and wetland restorations. Nearby Glendale School and Leopold Nature Center use the park extensively for environmental education. Tucked off Monona Drive and Femrite Drive, Edna Taylor Conservation Park offers three out-and-back hiking loops, a spring, marsh habitat, a glacial drumlin, oak stands, nature viewing platforms, and a Native American effigy mound. The area incorporates a little more than 3 miles of trails; the scenery is comprised of wetlands, willows, oak forest, ponds, savanna, and a handsome assortment of wildflowers. At the corner of the parking lot a large memorial stone dedicated to Edna Taylor denotes the trail’s beginnings. The trail starts in between high grass and pretty marshland, and is easy to follow and well-maintained throughout. Birders will have exciting field days watching Canadian geese, cranes, herons, and mallards. Redwing and tricolor birds are abundant in the marshy ponds, and the surrounding shrubbery is especially comely in the fall. Raspberries abound in the fields in July. Observation platforms at the edge of the ponds are great for spotting water fowl. It’s common in the springtime to spy tiny Canada geese chicks and tadpoles.On the east side of the park are six linear Indian effigy mounds and one panther-shaped mound, all listed on the National Register of Historic Places. Edna Taylor Conservation Park abuts the equally enjoyable Aldo Leopold Park; wedged in the thickness of evergreens, a sign denotes the change of parks. Trail traffic is generally pretty light, and the park is open 4 a.m. to 1 hour before sunset. Restrooms and water are available at the park office during those hours. Established in 1994, the Aldo Leopold Nature Center (ALNC) is an independent, non-profit organization. Through hands-on interactive programs and special exhibits, ALNC is leading the way to engage, educate and empowerthe next generation of stewards of the land for a healthy, happy, and sustainable future. ALNC offers many opportunities for you and your family to connect with nature both indoors and out. In addition to our special events and education programs, our indoor children’s exhibits provide a special place for your child to learn about Monarch Butterflies and Prairies, Native Fish and Wetlands and Woodlands. Visit our Exhibit Hall to learn about climate, weather and earth science using high-tech, interactive features found nowhere else in the region. Head outside and explore our wetland, woodland and prairie trails, open sun-up to sun-down, 7 days a week! Sign your child up for our Wonder Bugspreschool programs, vacation day nature programs and home schoolprograms for ages 5-12, or summer camps for ages 2-16. See you on the trails! Walk-in visitors, along with program participants and students, will continue to have access to our interactive theaters, our digital touchscreen curriculum, renewable energy displays, and our hands-on Leopold Family Phenology Center, along with our lobby Nature Nooks and our outdoor interpretive trails. Plus, we will continue improving drop-in and self-guided offerings for our visitors, including re-vamped Family Trailside Backpacks, identification guides and trail maps, and educational merchandise geared towards connecting and engaging visitors and families with our local habitats, flora, and fauna. And, using our grounds, phenology, Leopold teachings, and interactive multimedia curricula, we are continuing to integrate age-appropriate climate change education across our programming to help children understand these impacts, how their actions affect the environment, and how they can enact solutions to ecological challenges. From the Beltline Highway (US 12/18), drive north on Monona Drive 0.6 miles and make a right onto Femrite Drive. The parking lot for Edna Taylor Conservancy Park is on the left about 0.4 miles from Monona Drive. To the right of the parking is the easily identifiable trailhead.